Acquisition History: The Conner Farm property was acquired by the Department of Transportation as part of the Route 101/51 construction project, and transferred from DOT to Fish and Game. Description: Open fields comprise about ninety acres, and are leased for haying and corn. The forested portions are comprised of upland habitat containing oak, hemlock, and some white pine. Hardwood species of particular value to wildlife include red oak, white oak, black cherry, hickory, hop hornbeam, aspen and birch. 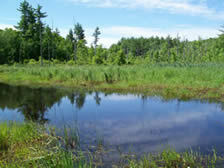 There is also a small freshwater marsh, a stream, and several beaver ponds. Common Wildlife: The variety of fields, forests, and wetlands make this ideal habitat for a variety of wildlife. Deer, turkey, migratory waterfowl, and small game all are found here. Grassland and wetland non-game species are also found. Special Notes: Pheasants are stocked at Conner Farm WMA. There is an agricultural agreement on the hay and cornfields, and the leasing farmer uses some storage sheds. The property contains the historic Conner Farm home that Fish and Game sold to a decedent of the Conner family in 2014 along with 5 acres that is clearly delineated by a fence. 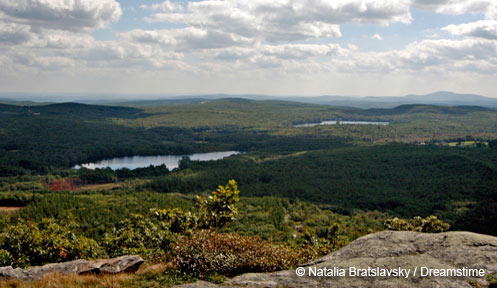 As it is now private property, public access is no longer allowed in that area, but the public is welcome to hunt, hike, and wildlife watch on the remaining 235 acres that is still owned by NH Fish & Game. Directions: There is a designated parking area off Route 27 near the house. Please do not park beyond the orange gate.